↑ Moore, Tony (9 September 2015). "Sir Richard no Virgin when it comes to airport lounge launches with laughs". Brisbane Times. Retrieved 5 May 2018. ↑ "Richard Branson". Retrieved 5 May 2018. ↑ "London's 1000 most influential people 2010: Tycoons & Retailers". Evening Standard. London. 26 November 2010. Archived from the original on 3 March 2011. Retrieved 11 June 2011. ↑ "Virgin tycoon is knighted". BBC. 3 January 2016. ↑ Barling, Julian. The SAGE Handbook of Organizational Behavior: Volume Two: Macro Approaches. SAGE. p. 383. ↑ "Thirty of the very best of British". The Telegraph. 13 November 2016. 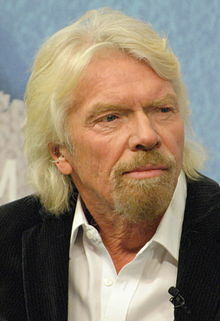 ↑ "Richard Branson". Forbes. Retrieved 30 January 2016. ↑ "Edward Branson". The Daily Telegraph. London. 8 May 2011. ↑ Nina Myskow (13 March 2013). "Like mother, like son". Saga magazine. Archived from the original on 5 November 2014. Retrieved 5 November 2014. ↑ "Richard Branson pens anniversary love letter to his wife Joan". Mail Online. Retrieved 2018-04-08. ↑ "Losing My Virginity – How I've Survived, Had Fun, And Made a Fortune Doing Business My Way". Bestsellersreviews.com. 3 July 2010. Retrieved 11 June 2011. ↑ "Old Stoics have birthday Teese". standard.co.uk. 15 October 2013. Retrieved 23 October 2016.